I haven't posted in a few days and realized how much time really slips by when you are having fun. "A Moo is a little card sized 2.8 x 7 centimeters, or approximately 1.1 x 2.8 inches. Beside this fixed size it is what you make of it! Choose whatever materials and techniques you like and show us how you worked within the theme". Well I am not about to embark on making them for trade, but.....I thought what a nice little thing to put in with trades I was going to send out with my artist info on the back. Moo's are great for using up those little pieces of paper you hate to throw out or small images or pieces you know you will eventually need. So....here are a few that I made using bits and bobs out of my paper stash. Of course no task goes by without an Asian theme to it. The Asian one I made using a used teabag, emptied it, dried it then stamped some bamboo leaves on it. The others I have used transparencies, stamps and images. Next photo below are some flowers I made using Tim Holt's Tattered Floral die. I have a Cuttlebug and just love cutting and embossing things for my art. I was given some handmade papers a while back, I believe Kathy, and, never used it til now. Even the black flowers look stunning.Nothing like a little paper, brad, some water spritz and scrunching to make these lovely florals. 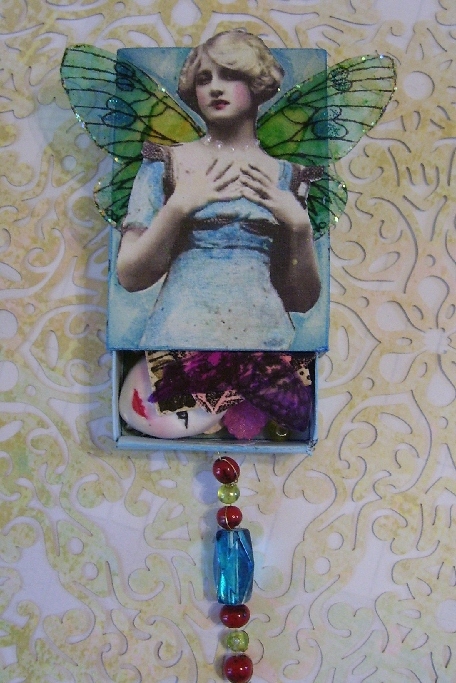 And this is the matchbox for my trade partner over at The Vintage Dragonfly matchbox swap for US/Canada FlickR group. This first swap was Things with Wings. I just love this woman image so I added some transparency wings I printed off and coloured with Alcohol inks and some Stickles. I love the greeny blue that I got from the 2 colours I used. I had not blue or green beads so I just added a couple drops of alcohol ink using Stream to the clear bead and it just make the beads pop. And I also filled it with mostly things with wing related items and a few other bits and bobs. I stamped the back with an image and the inside bottom of the box also has a message. Sure hope my partner likes it. 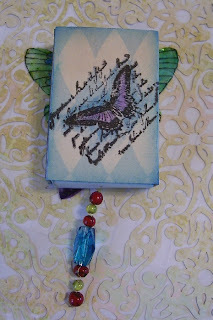 I love making these transparency butterflies. So much fun and you can custom make them to your own art. These are all such fabulous projects!!!! Everything is so gorgeous! Those flowers are calling my name! I haven't heard about the Tim Holt flower die - I really need to check that out! Your matchbox recipient will be thrilled! I have always liked this image, too and this lady has never looked lovelier than she does with your gorgeous transparent wings! I'll have to make some moos! Great post, Les! Wow fantastic projects - I love each one! Wow- amazing Moo's, flowers and the matchbox is outstanding! I love the wings and the beads. A lovely collection of moos and your matchbox is wonderful. Everything is wonderful but I am especially drawn to the matchbox, love that. Love your moos-and you know I adore that matchbox! What a lovely idea. We all have scraps lying around don't we LOL so theres no excuses. The matchboxes are lovely too! Thanks for your kind words on my blog. All the pieces you showed today are fabulous. Tough to pick a fav, guess it would be the matchbox , so cute. On moos I always heard they were half a business card. LOL. Thanks for the explanation about MOOs, have often wondered what they were. Yours are really lovely as is the matchbox and contents - your swap partner will be thrilled to receive it. Your moo cards are great! Love your matchbox...a work of art! The flowers are gorgeous too. All these are totally cool! 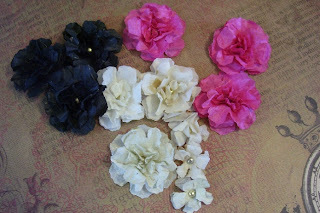 Moos, used to make those a long time ago, so glad you reminded me of them, yours are super!! Thanks for your visit by the way, so glad you did as it made me find your blog lol. I'll become a follower and add you to my blog roll. Hello Lesley, you have lots of lovliness here! I've never made a Moo (or two! ), yours are just lovely! Your flowers are gorgeous, they really do look like fabric. Love your matchbox too - great wings! Your matchboxes are wonderful! SO delicate!